But Angie understood what the Shelbournes were looking for. 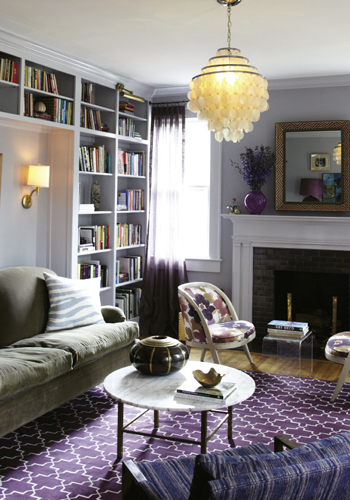 In fact, she and Daphne were simpatico from the get-go, a kinship first realized by Daphne when she began noticing the designer’s modern interiors in magazines, including a 2009 feature in Charleston Home. Then she spotted a Domino listing of Angie’s favorite things, and noticed they were also her favorite things (well, minus the Howard Stern Show). 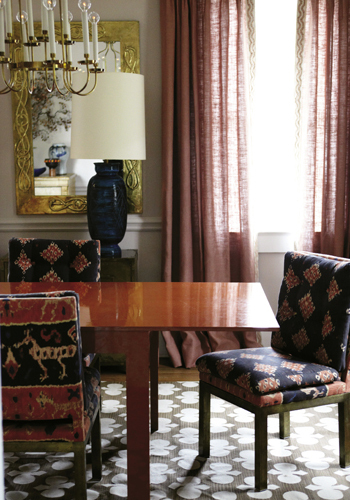 Finally—after visiting a friend’s home and marveling at its fearless, fresh eclecticism, and learning that, yes, she had some help, and yes, the designer was Angie Hranowsky—Daphne decided to give her style soul sister a call. Plus, there was another incentive: Daphne and Courtney’s decision to put their five-bedroom I’On home on the market and downsize was the first step in what would become both a lifestyle and a style shift. “Our friends told us we were crazy for trying to sell in this market, that our timing was terrible,” says Daphne. And if they were going to slim things down and simplify, Daphne was ready to part with traditional hand-me-down pieces and oversize sofas and chairs in favor of furnishings better suited to her innate, if daring, sensibilities (think big on color, streamlined, and modern). 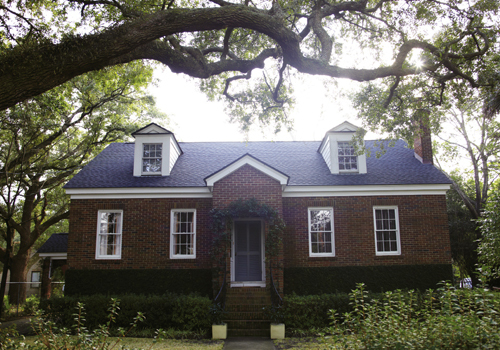 The Shelbournes set out to find a Mid-century Modern-style house, but as Angie pointed out, such places are hard to come by in the Lowcountry. So at her urging, they headed to Old Windermere—“one of the most beautiful neighborhoods in town,” says the designer. It was during the “cool stuff” roundup that Daphne and Angie were reminded of just how in sync their tastes are. When Daphne showed Angie a wallpaper sample she liked, Angie recognized it as one she’d used on a previous project. And when Daphne e-mailed a photo of a light fixture, Angie replied that a similar one was hanging in her own dining room. What followed were repeat forays to nearby Antiques of South Windermere, where they turned up numerous treasures, including a 1930s Deco mirror for the central hallway, glam enough to hold its own against the dramatic purple and pink Osborne & Little wallpaper. Other finds were muted Chinese panels now hanging in the den and the perfect “cocha” (daughter Ingrid’s term for a couch/sofa hybrid) for Ingrid’s killer bedroom—a pink toile palace that is the second-floor pièce de résistance. With blues, grays, and lavenders anchoring the walls, a cohesive palette holds the décor together, but each room has its own flavor and function. 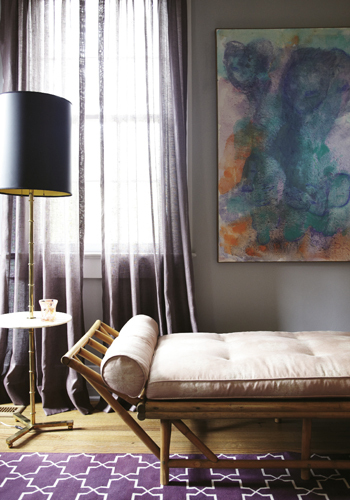 “Every space is practical—that’s one thing I love about it,” says Courtney, pointing out that in their former house, they rambled right past rooms they rarely used. Now the family eats in the dining room, reads and relaxes in the living room, and watches movies in the den. As for the kitchen, it’s much smaller, but more efficient. “We no longer have a dining bar, but now we sit down together and look at each other while we eat,” Courtney notes. Granted, there’s no master bathroom or walk-in closet, but they’re not terribly missed. “If we had those things, we’d just fill them with more stuff,” he says. “My friends ask me, ‘Where did you put all your clothes?’ and I tell them, ‘The consignment shop!’” adds Daphne. This move to simplify and become more intentional about their use of resources, space, and family time has resulted in other unexpected benefits from the “less-is-more” school of thought. “We walk everywhere…to the coffee shop or to get ice cream, to EarthFare or Normandy Farms bakery or to dinner at Al di La,” says Daphne. And Sampson and Stella, the family Airedales, hit the jackpot with the West Ashley Greenway in their backyard. “They think it’s their farm,” says Daphne. It seems that, in every way, what the Shelbournes “gave up” has returned to them tenfold. 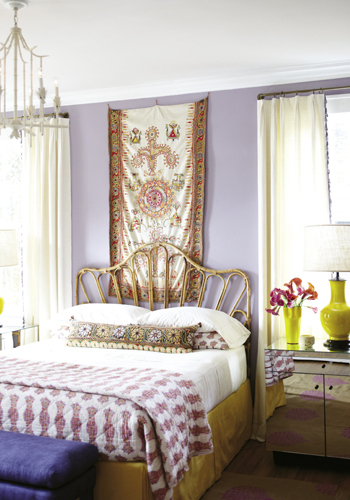 Vibrant and imaginative color choices are the designer’s signature. Her secrets?